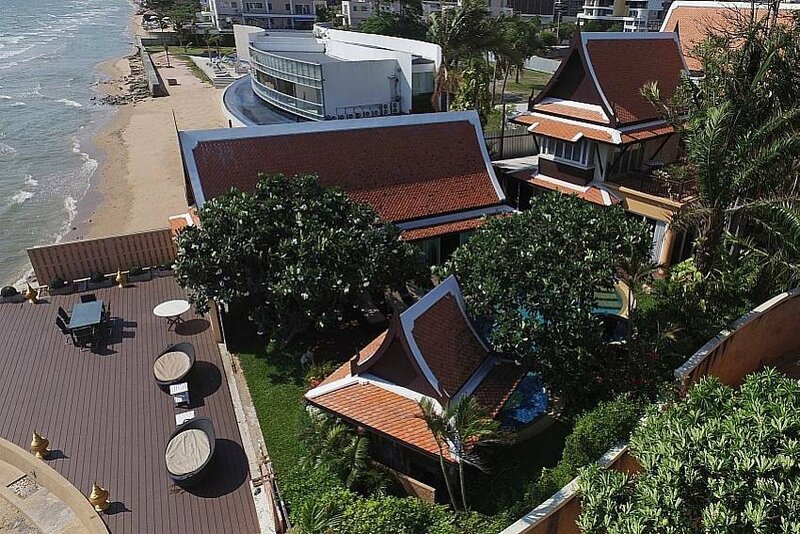 The traditional exterior of this Thai style holiday residence is a treat on your eyes and the unique interior with its individually designed spaces will delight and calm you. The 6 bedroom en-suite Villa Haven is a luxury holiday residence in a class of its own. Overlooking the sea you have 3 separate terraces on which to relax or dine, a private pool area with relaxing chairs and loungers as well as a covered lounging sala, heaped with mattresses and cushion. Then there is the private secured gate access to your own “private beach” a meter above the Gulf of Thailand. The huge open plan living area offers a curved bar complete with stools for a relaxing drink. Two lounge areas are located in the open plan living area—one with a sprawling white leather sofa and immense setellit TV, the other a more intimate conversation area near the bar, and both featuring pool and ocean views and access from the full-glass walls. There is a beautifully carved wooden table seating 12 people, and behind this are steps to the kitchen and private, exclusive “card” with gorgeous wooden panelling, crystal chandelier, and astonishing decor. The side terrace offers formal dining for 10 en pleine air. The upper balconies also offer spacious seating and dining options along with wonderful sea views. When it comes to bedrooms, the décor of each en-suite double bedroom is hand-selected by a world-class decorator, surpassing most all 5-star hotels. Of course, each one has air-conditioning, TV, mini-fridge, and safety boxes. Two of the bedrooms are poolside suites and the others are inside the main house. The master suite at the uppermost level has commanding views and private indoor and outdoor seating areas. Although the temptation will be to stay in your luxurious surroundings, there are plenty of opportunities to visit local attractions. You are close to the Floating Market and Alangkarn Theatre and a little further afield is the peaceful Bang Saray beach with some excellent seafood restaurants right on the seashore. The Big Buddha can be visited en-route to a wonderful Chinese Temple and many other attractions will mean those days out are filled with interest. Jomtien Beach is just a 5 minute drive and Pattaya’s non-stop city centre can be reached in 15 minutes. You really do have the perfect, tranquil location with easy access to many different attractions. There are 4 en-suite bedrooms in the main house and 2 en-suite bedrooms by the swimming pool. Each one has been individually themed and designed. Comfortable double beds, aircon and TVs in each one ensure total comfort. One has its own private balcony while another bedroom has direct access via glass sliding patio doors to a large balcony. This balcony can also be accessed via a door on the first landing as well as via steps from the master bedroom at the top of the house. The master offers complete comfort with wonderful decor, a classic sofa and a writing table with chair which looks out to sea views. There is one guest bathroom by the bar area with the other six being en-suite with the bedrooms. This means complete privacy and comfort is yours. All of the bathrooms are tiled and decorated to the highest standard and offer skylights or ocean views. The master en-suite also has a changing area and wardrobes between the bedroom and bathroom. The fully fitted kitchen with built-in units is accessed via steps down from the living area. You have a granite topped island which doubles as a food preparation area and a breakfast bar. All the necessary appliances for you to cook whatever pleases are available, and your choice of where to serve is huge. In the downstairs living space you have two lounge areas. Both face the swimming pool. One has a huge sofa, coffee table and large flat screen TV while the other has a sofa armchairs and table and is next to the bar area with its bar stools and wooden bar top. There is a second area with stone benches and a central water feature next to the kitchen. Your 12 seat carved wooden dining table in the open plan living space is fit for a banquet. Then there is the elegant private “card” room which seats 6 next to the kitchen. As for outside dining you have 3 terraces to chose from, with the most formal option on the ground floor seating 10.